The Mikoyan MiG-27 (NATO reporting name "Flogger-D/J") is a ground-attack aircraft, originally built by the Mikoyan design bureau in the Soviet Union and later license-produced in India by Hindustan Aeronautics as the Bahadur ("Valiant"). It is based on the Mikoyan-Gurevich MiG-23 fighter aircraft, but optimized for the air-to-ground role. However unlike the MiG-23, the MiG-27 did not see widespread use outside Russia, as most countries opted for the MiG-23BN and Sukhoi Su-25 instead. It currently only remains in service with the Indian, Kazakh and Sri Lankan Air Forces in the ground attack role. All Russian and Ukrainian examples have now been retired. The MiG-27 shares the basic airframe of the MiG-23, but with the revised nose - nicknamed “Utkonos” (“Platypus”) in Russian service, first introduced on the MiG-23B - stronger undercarriage, simpler intakes and a shorter exhaust nozzle, without radar in favor of a downward-sloping profile for improved pilot visibility, a laser rangefinder and marked-target seeker. Among the tester pilots it was also called “Balkon” (“Balcony”) because of the increased frontal view from the cockpit. Additional cockpit armor is installed, along with a totally new nav/attack system. Because the MiG-27 is intended to fly most of its missions at low altitude, the MiG-23's variable intake ramps and exhaust nozzles were deleted in favor of a simpler, fixed configuration, reducing weight and maintenance requirements. The aircraft also has larger, heavy-duty landing gear to facilitate operation from poorer-quality airfields. MiG-27 aircraft entered service with the Sri Lanka Air Force in 2000. Since then, they have seen regular service, bombing strategic targets and providing close air support. 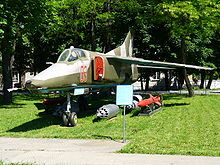 In August 2000, a MiG-27 crashed near the Colombo international airport, killing its Ukrainian pilot. In July 2001, a second MiG-27 was destroyed on the ground during an assault to the same air force base by the LTTE. Another MiG-27 crashed into the sea near the airport in June 2004. MiG-27 jets played a crucial role in Sri Lanka. On 27 May 1999, during the Kargil War, one Indian MiG-27 was lost together with a MiG-21 while supporting Indian ground offensive in Kashmir region. Both pilots ejected and one of them, Flight Lieutenant K.Nachiketa was later captured by Pakistani forces and the other one Sqn. Ldr. Ajay Ahuja is believed to have ejected safely, but was subsequently killed by the Pakistanis. In mid-February 2010, India grounded its entire fleet of the aircraft after a MiG-27 crashed on 16 February 2010 in Siliguri, West Bengal. The crash and subsequent grounding is attributed to defects in R 29 engines of the aircraft, suspected to have occurred during overhauling of the aircraft by the Hindustan Aeronautics Limited [HAL]. 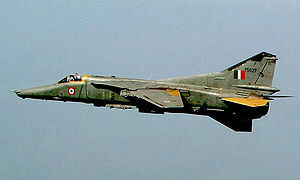 Since 2001, the Indian Air Force lost 13 MiG-27s in different crashes. Kazakhstan MiG-27 Flogger is still in service with the Kazakh Air Force. The first MiG-27, and it was the first in the MiG-27 family to have a canopy without the central frame, suggesting that the ejection seat was designed to directly break through the transparency. The dielectric head above the pylon on the MiG-23 was used on the MiG-27 to house electro-optical and radio-frequency gear instead. It was armed with a Gryazev-Shipunov GSh-6-23M Gatling gun. Nato reporting name: Flogger-D. The nuclear strike variant of MiG-27, with a PSBN-6S navigation/attack system specially designed for the mission. 560 MiG-27D were built from 1973-1977 and they were on permanent stand-by alert basis like the FB-111A of the United States Air Force. Nato reporting name: Flogger-J. This model was an upgrade of the MiG-27, with the electro-optical and radio-frequency heads above the glove pylons deleted. It was first armed with the GSh-6-23M Gatling gun, but this was later replaced by a new 30 mm GSh-6-30 six-barrel cannon with 260 rounds of ammunition in a fuselage gondola. It also received much-improved electronic countermeasure (ECM) systems, and a new PrNK-23K nav/attack system providing automatic flight control, gun firing, and weapons release. However, this modification was not very successful because of the heavy recoil from the new cannon, and bursts longer than two or three seconds often led to permanent damage of the airframe. Test pilot V. N. Kondaurov described the first firing of the GSh-6-30А: "As I imposed the central mark on the air target and pressed the trigger to shoot, I heard such noise that I involuntarily drew my hand aside. 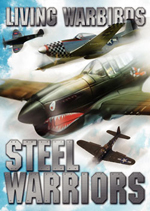 The whole plane began to vibrate from the shooting and had almost stopped from the strong recoil of the gun. The pilotless target, which was just making a turn ahead of me, was literally disintegrating into pieces. I have hardly come to my senses from unexpectedness and admiration: This is a calibre! Such a beast! If you hit something - it will not be little [damaged]". A total of 150 MiG-27Ms were built from 1978 to 1983. Currently in service with the Sri Lankan Air Force. This was an export variant of the MiG-27M provided in 1986 to India in knock-down kits for license-assembly. 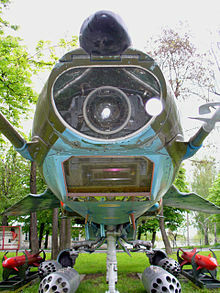 Same as MiG-27M except the undernose fairing for the infra-red search and track (IRST) sensor has a single window instead of several like the one on the original MiG-27M. A total of 130 were assembled by India. India refers to this model as MiG-27M Bahadur while MiG-27L is Mikoyan export designation. This was a 1988 indigenous Indian upgrade of its license-assembled MiG-27L with French avionics, which provides the same level of performance but with much reduced size and weight.The capabilities of the aircraft are being enhanced by the incorporation of modern avionics systems consisting primarily of two Multi-Function Displays (MFDs) Mission and Display Processor (MDP), Sextant Ring Laser Gyros (RLG INSI), combined GPS/GLANOSS navigation, HUD with UFCP, Digital Map Generator (DMG), jam-resistant Secured Communication, stand-by UHF communication, data link and a comprehensive Electronic Warfare (EW) Suite. A mission planning and retrieval facility, VTR and HUD Camera will also be fitted. The aircraft will retain stand-by (conventional) instrumentation, including artificial horizon, altimeter and airspeed indicator, to cater for the failure of HUD and the MFDs.The MiG-27s are also being endowed with French Agave radar or the Russian Komar radar. The installation of the radar would give the MiG-27s anti-ship and some air-to-air capability. It is expected that at least 140 of the 180 aircraft converted from MiG-27MLs. Nato reporting name: Flogger-J2. The MiG-27K was the final Soviet version, which added a laser designator and compatibility with TV-guided electro-optical weapons. Originally armed with the GSh-6-23M gun, but this was soon replaced with the GSh-6-30 cannon. Around 200 were built. Picture - Operators of the MiG-27 in blue (former operators in red). NB. Iran is mistakenly shown as blue when it should be red. Cuban Air Force received 15 Mig-27s. Picture - Indian MiG-27 & USAF F-15. Russian Air Force retired their aircraft from front line use, still used in reserve and in storage. Soviet Air Force passed their aircraft to successor states. Eden, Paul, ed. "Mikoyan MiG-27". 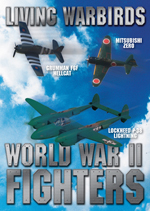 Encyclopedia of Modern Military Aircraft. London: Amber Books, 2004. 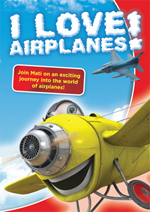 ISBN 1-90468-784-9. Green, William and Gordon Swanborough. The Great Book of Fighters. Osceola, WI: Motorbooks International Publishing, 2001. 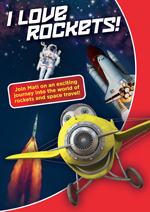 ISBN 0-76031-194-3.